My idea is to make them to where it will break down completely, and be completely self contained. Also by cost effective I think keeping the total price for the buyer to be under $150. The ammo can range from $15 to $40 so the rest would be in angle iron, expanded metal, paint, welding time, and consumables. With the right idea you could build some that were better than the ones offered for sale. Sometimes it can be cheaper to buy one from someone that can build it because the price you will pay for a bunch of material that you most of it you will not use. Overall keeping it under $150 with shipping, and every thing would be ideal. My canvas Springbar tent has a fabric stovepipe jack sewn in, with a tie-down flap. I've also seen 2-piece steel jacks, basically diamond shaped with the pipe hole centered and pins or bolts at the side points to spread the canvas (you cut a slit and secure the ends with stitching). Just built myself a wood stove and sewed a tipi out of silnylon for our December Grand Canyon trip. It worked out like a champ- t-shirt/shorts weather inside, and pretty efficient in terms of fuel. 15-20 minutes set-up for both tipi and stove. Stove legs are threaded rod with a nut on the outside and idside of the box. stovepipe is .005" stainless steel shim stock, 100"x12". Rolls up to go inside the 20mm box. Used an empty bernzomatic cylinder cut in half with top and bottom removed to stiffen each end of the stovepipe. Total cost was around $200 in materials for the tipi, maybe less because I have a ton of leftover fabric. Stove cost was around $70 for materials. Here's a pic of the stove. Photo of the outside coming. Cheap, easy to build and very effective. Build your wood stove out of common galvanized stove pipe (choose your diameter for what you need in a stove), buy and install two end caps. In one end cap, cut a door and make an adjustable vent and on the top of your stove cut a hole for your wood stove's stovepipe. Get fancy and bend some sheet metal like this l__l flip it over and rivet it to the top of your stove so you can put a pot of water on the stove. Easy to build with simple tools, super light, and cheap. Climbdenali- your photos aren't showing up for me. Would you please repost? I'd love to see what you made (for both the stove and the tipi). Did you ever have lots of people in the tipi? Have any issues with condensation on the silnylon? What was the diameter of the tipi? I love the BD megamids, but I find the newer, lighter ones out of silnylon are much less functional b/c of the condensation issues with such a non-breathable fabric (I can't touch the fabric of the silnylon in the night if it's chilly or my bag gets wet). Curious how the tipi turned out. thats cuz you haven't had a sil nylon tipi with a wood stove, no condensation in there! 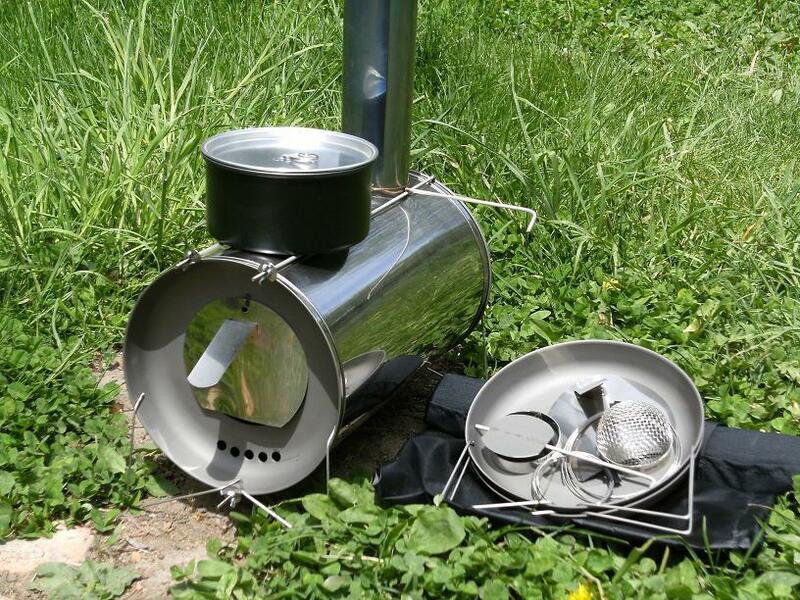 Build your wood stove out of common galvanized stove pipe (choose your diameter for what you need in a stove), buy and install two end caps. shappa- I'd assume that if the temp was kept up in the tipi all night (if people slept in it) that it would be too warm for condensation. However, this leads to all my questions about how big of a tipi, how many people, and any other pertinent information (outside temp?). Wouldn't someone have to stoke the fire every few hours? I've slept in a 16ft tipi a few times in the winter, and found that it is an art (that I don't have) to keep the temp somewhat regulated. Granted, these were with an open campfire as opposed to a wood burning stove. I'd never considered making one out silnylon. Just looking for more info/details. on my floorless tent MSR twin brother (6'wide, 14'long, 6'tall) with two large men inside at temps in the upper teens at night, before I go to bed I have a kindling bundle and some good wood ready to go by the knico packer stove, right about the time I have to take a pee in the middle of the night, I get the fire going again. That takes the chill and condensation off until its time to get up and put on the coffee.